First and foremost remember to breathe and smile. This time of your life is both wonderful and stressful. Deep breathing has been proven to be very beneficial. The many benefits include a reduction in stress and blood pressure. Deep breathing releases natural “free-good” hormones in our body. Learning a few techniques and tuning into your body for just a few moments can help. If you can force a smile on your face. A smile can be enough sometimes to turn any situation into something to find humor within. Try calming breaths while giving your infant a massage. Use your tribe and forget as much as possible about modesty. Your tribe, or your support team, doesn’t care what you look like or that you haven’t showered in several days. They love you for who you are and not anything else. Those first weeks can be challenging, especially if you have a children with medical needs. Let them help so you can a little rest to keep yourself going strong. Talk to yourself. It might feel funny at first but it can help. It doesn’t matter what you say. I often find myself talking about anything and everything- the plan for the day, what is happening right now, about my son’s family, etc. The added benefit of talking to yourself is your child also gets to hear your voice. Try to develop routines early. It’s really hard the first weeks adjusting and even thinking about routines. I’m not even sure most newborns have routines aside from eat, sleep, and diaper changes; however, if you can try to establish some routines it will help your sanity and also help your newborn develop. For my little one, we try to follow a little routine of eat, quiet alert/play if he stays awake, and sleep. I try to use similar songs and even sing the same song over and over when he is trying to sleep. You can even plan to take a stroller walk around the block the same time every day. Having routines help signal to our bodies a sense of calmness and can provide a little bit of organization when things are crazy. Sensory strategies can be your best friend. Some ideas include the use of auditory input such as white noise, talking softly, or singing, movement and swings, and deep pressure or swaddling. It was crazy what a little bit of white noise did for my son. It was enough to calm and quiet him. Now I use it at bedtime to help him get back into a deeper sleep. I use one with a timer so it doesn’t run continuously. I also talk a lot to my son. It was amazing how fast he learned to recognize my voice and respond to a calm voice, if he wasn’t too upset. I was never someone who spoke aloud but now I found myself telling him all kinds of things. I think the soft melody of my voice must have some calming property for him. Also deep pressure and movement can help a newborn in those early months. When a newborn enters this world they are in a position called physiological flexion which they slowly work out of over the next month or two. Swaddling provides physical boundaries much like the womb which allows your child to feel secure. When they wiggle within the swaddle believe it or not they are learning very early about where their body is in relation to this great big world they entered. Along with swaddling you can also try massage. Infant massage has shown to be a wonderful bonding time for newborns are their parents. Movement is the next sensory strategy. I was very lucky my son loved his swing from the very beginning. I don’t know if this had anything to do with how much I moved around on my job, but back and forth movement is one of the best ways to help calm a child. Rocking chairs and swings can be your best friend. If you find this newborn phase to be very difficult or think you child may not be reaching his/her milestones, talk with your pediatrician and schedule an evaluation. Many parents find physical, speech, occupational or nutritional therapy for short or long periods provide much needed support and growth for their infants. Learn more at eastersealsdfvr.org. Having an infant born prematurely can be a scary experience. The team of physicians, nurses, and therapists that work with your infant until discharge do their best to assist in whatever your child may need during their stay. But once the baby is discharged, what can you do to continue to promote the appropriate development of your child? Preemies develop differently, compared to full term infants, so here are a few tips and tricks from what you can do at home. Typically, the preterm infant’s head size is large compared to their body, and are at a greater risk for developing Torticollis and/or positional plagiocephaly. Frequently changing the position of their head is important to prevent these types of concerns. Preemies tend to utilize their shoulder muscles to assist with breathing. It is important to transition them to using their shoulder girdle muscles to reach, prop, and play. Gravity can be your friend as you carry or position your baby in more upright positions to promote flexion and midline. Carrying your baby: be sure your baby’s arms are forward and hips and knees are bent to promote flexion. Bouncy seat (such as the Baby Bjorn): promotes midline flexion in an upright position to aid in digestion. Gravity will also assist to relax the shoulders. Prone positioning – Remember back for sleeping, Tummy to play! At this point, your child’s vision is continuing to develop. Up until 4 months of age, a child can see black and white toys, or highly contrasted colors, better than distinguishing between colors. Red and Yellow are the first colors they can begin to see. For the same reasons as above, present your face or a toy 8-10 inches away from your child when interacting/playing with them. For most children who have undergone a stay in the NICU, it is recommended to have continued care through a NICU Follow-Up clinic. The purpose of the NICU Follow-up Care is to monitor and manage ongoing medical conditions, provide support and guidance to parents and caregivers of the high-risk infant, monitor developmental progress to identify delays, identify need for referrals to other medical professionals a needed. The ultimate goal at the Neonatal Follow-Up Clinic at Easter Seals DuPage & Fox Valley is to assist your baby in being the best that he or she can be. Click here to learn more about our clinic. How do I know if I am doing enough to foster speech and language development to keep my baby on track? What communication milestones should I be looking for? In general, these are a few communication milestones that you should be looking for in the first year of life from the American Speech-Language Hearing Association (ASHA). Here are 8 tips to help meet these milestones, engage, and expand your child’s ability to communicate. Child-directed communication. The amount and quality of language has a huge impact on your child’s communication development. Research has shown that babies benefit greater from child-directed communication rather than language that is overheard (e.g., asking your child a question vs. listening to the TV in the background) Take the time to smile and enjoy your child through communication exchanges. Imitate your child’s sounds and actions. Imitation is a very important skill for your child to learn. Imitating your baby encourages him/her to notice you and even imitate your actions and/or words. This skill is vital for expanding babbling to initiating first words (e.g., “Mamama”, “babo”, etc.). Put the child’s message into words. When your child sends you a message by reaching, pointing, looking, or making a sound; put into words what you think he is trying to tell you. Be repetitive, children learn through repeated exposure to target words. (e.g., Do you see the ball? Ball, Here is the ball.). Offer your child choices. Hold up two objects and show each object as you name it. You can ask, “Do you want crackers or bananas?” Observe how your child communicates his/her choice-looking at the one he/she wants, reaching toward it, pointing to it, making a sound or saying the word. As soon as your child lets you know what he/she wants, give it to him/her which will allow him/her to experience the power of communication! Pause during a familiar routine to tell your child it’s his turn. When you and your child are doing something repeatedly (e.g., swinging, tickling). Pause during the activity from time to time. For example, after you have tickled your child, stop the game and WAIT for him/her to let you know that he/she wants more. Don’t say anything-just look expectantly. See if your child will tell you to continue in anticipation for that desired activity. Sign Language. Sign language is the use of a gestural system to communicate. Signs can be used to reduce frustration and give the child a way to communicate his wants and needs while he/she is still coordinating their speech production system. (My personal favorites are “more”, “all done”, “milk”, and “up”). In summary, the best way to foster speech-language development with your child in their first year of life is to: TALK, PLAY, READ, and SING! If you have any questions or need additional support, please contact a speech-language pathologist for more information. If you are concerned about your child’s language or other development, take our free online developmental screening tool for children birth to age five. The Ages and Stages Questionnaire (ASQ) will showcase your child’s developmental milestones while uncovering any potential delays. Learn more at askeasterseals.org. Do: Invest in a good playpen/encompassing safety gate. This way, you can make dinner or fold laundry with your child safely playing within your line of sight. 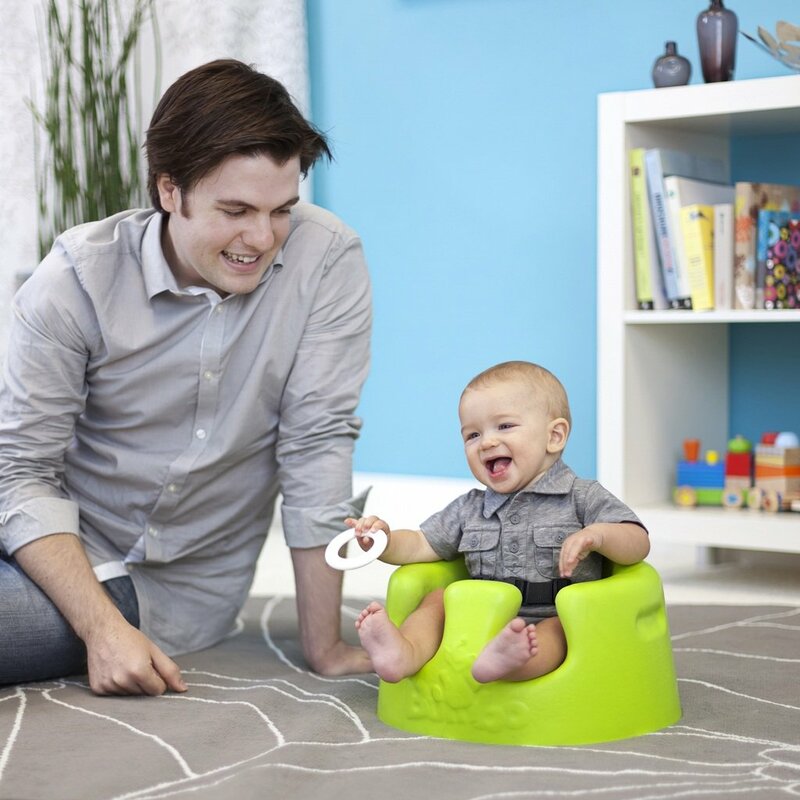 Your child will be able to roll, pull up, crawl and improve his gross motor abilities and not get into things such as the flowers on the coffee table or your husband’s important work files in his briefcase. Additional bonus: if you have a dog in your house, this is a good way to keep them interacting and in the same room without the worry that your favorite four-legged friend will accidentally knock-over your two-legged child. Do: Get toys for your children that are old-school. Think blocks, balls, books, musical instruments (remember your little four-key piano? ), magnet letters, and shape sorters. These types of toys are great sensory experiences, and will help your child learn the concepts of: putting in/taking out, cause-effect, hand-eye coordination and recognizing and producing different tones for speech production. Additional bonus: your parents may have saved these toys from your childhood (as I learned recently as my Mom showed me a whole closet of bins of age-labeled toys that she pulled out the other week). These types of toys are also easily found at garage sales for super-cheap. As I recently learned, registering for a baby can be a really fun process (honestly, who doesn’t like using the scanner-gun?) but can also be quite overwhelming. Try not to be suckered into every high-tech piece of baby equipment out there, because chances are, you and your baby won’t need it. Instead, remembering what you grew up with (Legos, books and play-pens, oh my!) can lead to a better reality of what will help your child develop. For more information about Easter Seals DuPage & Fox Valley please visit EasterSealsDFVR.org. Step into any baby store, and you will no doubt see a large number of devices that ‘contain’ your baby. These ‘containers’ range from Bumbo seats, swings, bouncers, car seats, walkers, jumpers and exersaucers. The ‘container baby’ is a relatively new term used in pediatrics to describe a baby that spends a lot of its time in a containing device. When a baby is in this type of device, it does not allow the baby to move around and explore its environment. This places the baby at risk for gross and fine motor delays, torticollis (tightening of one side of the neck), plagiocephaly (flattening of one side of the head), and brachycephaly (flattening of the back of the head), not to mention a lack of sensory experiences. Help your baby love tummy time. The American Academy of Pediatrics recommends that all babies sleep on their back. However, supervised playtime on baby’s tummy will help develop neck, back, and shoulder muscles and help to ensure a nice, round head. Starting when you first bring your baby home from the hospital, place your baby on his tummy 3-4 times per day, and aim for about 5 minutes of tummy playtime each time. Some babies will not like tummy time at first, but will eventually prefer it. Incorporate mirrors at their level, use a boppy pillow for support, and even get down on the floor with your baby to increase bonding. Playing games like ‘airplane,’ placing baby on your chest on her tummy while singing a song, and colorful tummy time mats are also helpful. Limit the ‘containers’ that you buy in the first place. Sure, car seats and strollers are must haves. However, Bumbo seats, bouncers, and swings should be used in moderation, if at all. A good rule of thumb is to think back to your childhood. Did your parents have enough baby equipment to fill up an entire living room? Probably not. In fact, the best toys and things for your babies are things that can fit in a toy chest: blocks, puzzles, books, colorful toys and balls. Baby store associates are very good at convincing you that you will need every item of equipment on the market. Try not to give in and think about what you will really need/use and what will best promote development and learning for your baby. Good “containers” include playpens and front and back carriers. In a playpen, your baby will have room to learn to roll, pull to stand and crawl while you get a few minutes to do the dishes or put a load of laundry in the washing machine. The front and back carriers also promote good head control, allowing your baby to look side to side and increase bonding between you and your baby. With the amount of baby equipment on the market, it is hard to decide what your baby will actually need and benefit from. Try to limit ‘container’ usage to help your baby have the best development possible.